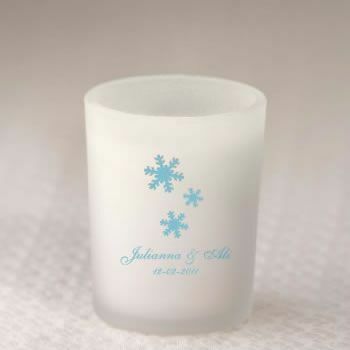 Winter is a wonderful season for weddings so celebrate the season of light with our personalized winter votive favors. Measuring 2.5" tall and 2.125" in diameter, these winter favors include a poured white tealight candle within a white frosted glass votive holder. You can select from our array of winter designs available on line or you can create your own while also selecting the color and text. A beautiful addition to wintry table settings, our personalized winter votive favors make terrific gifts for family and friends. The imprint on the votive glass came out really well. The candle on the inside was about half the size of the glass, much lower then the picture shows. My candles arrived in a timely manner and they are beautiful. My daughter was very happy and loved the candles, would definitely buy again.